The 12th season of Indian Premier League which is also known as IPL is going to start soon from March 23. So here get some facts related to Indian Premier League like Indian Premier League Orange Cap, Most runs in Indian Premier League. The orange cap is a reward given to the player who is top scorer in the whole season of Indian Premier League. So in the Indian Premier League tournament, it roams from one batsman to other and at the end, the Orange cap goes to the highest run-scorer through the whole tournament. Till now the Orange cap has given to the 11 players as 11 seasons of Indian Premier League have been played. So this reward Indian Premier League Orange Cap is a great reward for the batsman and every batsman wants to achieve the title of Indian Premier League Orange Cap. Here I am going to give you the list of players who have successfully achieved this Indian Premier League Orange Cap reward. 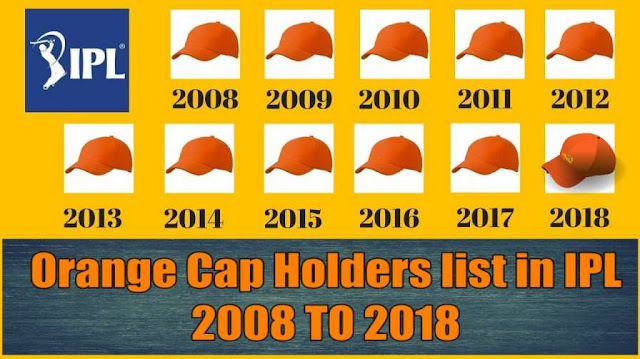 Below is the list of Indian Premier League Orange Cap winners of all seasons from 2008 to 2018. The first season of Indian Premier League was played in 2008. This was the beginning of a new format in the Cricket introduced by BCCI. There were 8 teams in the tournament. Rajasthan Royals won the tournament. Shaun Marsh was the orange cap holder in the first season of Indian Premier League. He Scored 616 Runs in 11 innings playing for Kings XI Punjab. Indian Premier League Orange Cap winner of the second season was Australian player Matthew Hayden. He scored 572 runs in 12 matches playing for Chennai Super Kings. He scored 5 Half-Centuries with the strike rate of 144.81 and grabbed Indian Premier League Orange Cap in IPL 2009. There is nothing which the God of Cricket cannot do. He was able to grab the Indian Premier League Orange Cap to his name. He scored 618 runs and broke the record of Shaun Marsh. He smashed 5 half centuries and his knock of 89 not out was the best. Chris Gayle was the Indian Premier League Orange Cap holder in the 4th season. He is known for his big smashing batting style but he was able to score some big runs in the season. He scored two 100s and 3 half-centuries in the 4th season and made total 608 runs in 12 matches. Once again Chris Gayle showed that what he was capable of. In the 5th season of IPL which was in 2012, Chris Gayle scored 733 runs in 14 matches and held Indian Premier League Orange Cap once again. Gayle scored one century and 7 half-centuries in the tournament playing for RCB. The Australian Batsman Mike Hussey was the Indian Premier League Orange Cap holder in the 6th season of IPL. Playing for Chennai Super Kings, Hussey made 733 runs in 17 matches and became the most dependable batsman for Chennai Super Kings. This was a dream season for Robin Uthappa. The star cricketer of Karnataka has scored 660 runs in 16 games and became Indian Premier League Orange Cap holder. He was the key player of KKR's win in the tournament. Uthappa scored 5 half-centuries in the season. Australian players have always been very good in the Indian Premier League. So in the 8th season of IPL, David Warner was the Indian Premier League Orange Cap holder. He has scored 562 runs in 14 matches with a strike rate of 156.54. He was the captain of Sunrisers Hyderabad. Virat Kohli was the Indian Premier League Orange Cap holder in the 9th season. He broke all the records by scoring 973 runs in 16 matches with a massive average of 81.90 which is still the highest in IPL history. He smashed 38 sixes and 4 centuries in a single season which is still a record to be broken. Once again the Australian opener grabbed Indian Premier League Orange Cap by his brilliant performance n the 10th season of IPL which was IPL 2017. He scored 641 runs in 14 matches with a huge strike rate of 141.81. This was the second time that David Warner became Indian Premier League Orange Cap holder. The previous season of IPL was the 11th season. In the 11th season, Kane Williamson was Indian Premier League Orange Cap holder. Williamson was playing for SRH as well as leading the team after Warner getting banned. Kane Williamson scored 735 runs in 17 matches. So that was the complete list of Indian Premier League Orange Cap holder from all seasons of Indian Premier League. As we have seen there are two players who have grabbed Indian Premier League Orange Cap twice in the whole seasons. Who will the Indian Premier League Orange Cap holder in IPL 2019?